The Deployment diagram is one of the Unified Modeling Language (UML) Structural diagrams that can be used to model infrastructure, including a wide range of deployment environments. Both physical and virtual environments can be modeled, including infrastructure and networking services and protocols. The Deployment diagram can be used to model a wide range of infrastructure and networking environments including physical and virtual environments. It is quite common to model a number of different environments including: production, pre-production, test and development environments. 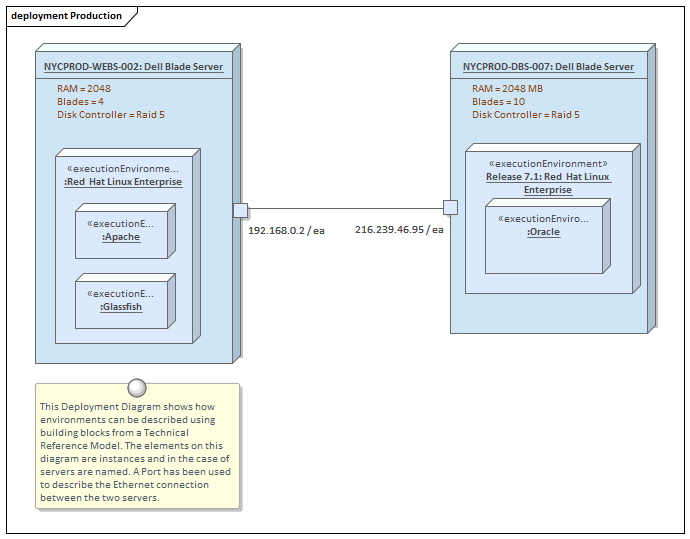 The diagram can be used to model Servers, Devices, Networks, Execution Environments. Switches, Routers, IP Addresses and the software components and Artifacts deployed. It is quite common to use the Deployment diagram to model a number of different environments, including production, pre-production, test and development environments. Alternative images can be used in diagrams to represent infrastructure and networking devices, such as Networks, Servers, Routers, Switches and more, making the diagrams more compelling and appealing to their audience. The diagrams can be included in documentation generated automatically using the Document Generator. 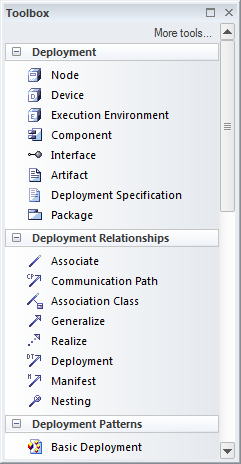 There is a toolbox that contains a range of elements, relationships and Patterns for creating Deployment diagrams. The Deployment diagram (like any diagram) can be viewed as an element list, which makes working with element properties easier. Diagram Filters can also be used when presenting the diagrams, to draw attention to parts of the diagrams; the diagrams can be presented in hand drawn or whiteboard style by changing the properties of the diagram.